ARS board members (from left): Brad Bagasao, PhD., CEO; Kathryn Endo Roberts; Ben Kim, vice chair; Donna Ogawa, chairperson; Leo Pandick, Ph.D., secretary; Joshua Yoon, treasurer; and Dr. Alexander Sinclair. Not pictured: Jay Mitchael (who was unable to attend) and Rev. Samuel Lee. ARS clients performed Hawaiian dances. At right is Mia Yamamoto on guitar. 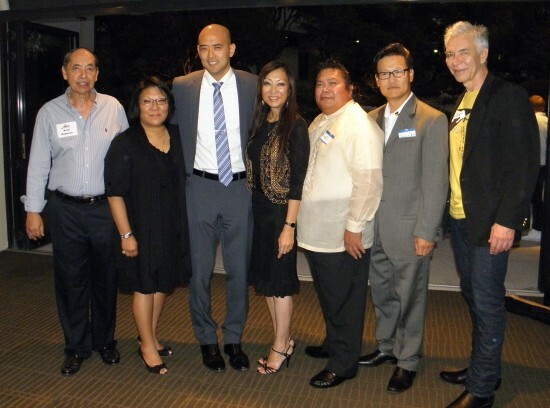 Asian Rehabilitation Service Inc. (ARS), which turns 40 this year, held a reception fundraiser on Aug. 31 in the Garden Room of the Japanese American Cultural and Community Center in Little Tokyo. ARS is a workforce development non-profit focused on serving persons with disabilities, including those with limited English proficiency. Founders Sachio Kano and Seigo Hayashi had a vision of enabling Asian Americans with disabilities to lead productive lives, rather than being hidden from society. ARS was established in 1972 in Little Tokyo and for its first few years was headquarterd in the basement of the old Union Church, which is now Union Center for the Arts. It has moved a few times over the years but is still in the vicinity of Little Tokyo at 1701 E. Washington Blvd. 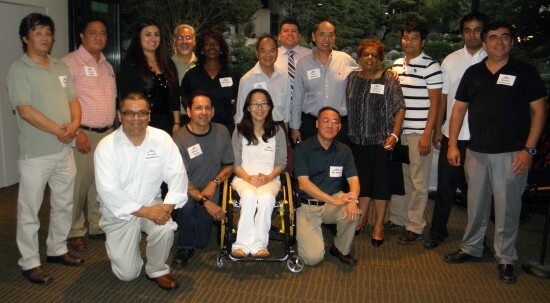 The event was hosted by ARS Chairperson Donna Ogawa and Vice Chair Ben Kim. The agency’s new CEO, Brad Bagasao, Ph.D., was introduced. 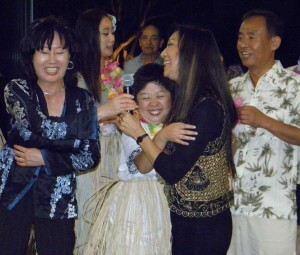 ARS client Hee Jung hugs Chairperson Donna Ogawa after the dance performance. Mike Fong, East Area director for Mayor Antonio Villaraigosa, delivered greetings on behalf of the City of Los Angeles. Kim presented distinguished service awards to former ARS Chairperson Marguerite Ave Womack, who “stayed on during … really tough times,” and current Deputy Director Si Ho, who, when ARS was trying to find a new CEO, was willing to “step up and be a leader … when our organization needed it the most.” Former Chairperson Guy Leemhuis was also honored but was unable to attend. Staff member Kim Daniels was given special recognition for overseeing ARS’ government contracts. ARS has employees who work off-site at federal courthouses in Los Angeles and Pasadena, the Drug Enforcement Administration in Los Angeles, and the Social Security Administration in Pasadena. Pegasus Financial Group, represented by owners Ali Movahedi and Nicole Taban, was thanked for helping to stabilize ARS financially. Former CEO Tom Chung commented, “It’s really good to see ARS climbing that ladder again … I’m glad to see a lot of the new people brought on board. Looks like a good crew.” The efforts of the “caring board” and “excellent staff” can be seen “on the faces of many of the clients,” he said. The event also included a silent auction and music by Mia Yamamoto and Kawika Dacoscos. ARS staff members (back row, from left) Byung (Stephen) Yun, Ruben Dugay, Cynthia Escalante, Frank Larrinua, Kim Daniels, Si Ho, Carlos Ampuero, Brad Bagasao, Connie Rogers, Ronald de la Cruz, Koko Naing, Wilfredo Maldonado; (front row, from left) Ricardo Magallanes, William Aldana, Minji Kim, Hoi Wong. 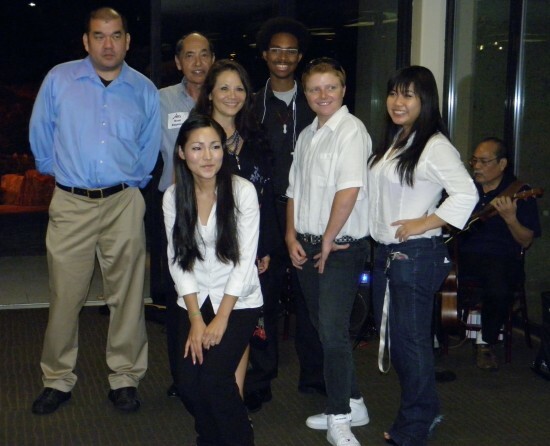 ARS CEO Brad Bagasao (in back) with ARS volunteers (from left) Jun Watanabe, Talor A. Williams, Nancy Hayata (foreground), Kendall Andersland, Charisse Love and Alfa.